Welcome to the President's Blog! We are heading into our busy season, but I want to look back at 2016 for a moment. At the meeting two weeks or so ago, I went through the 2016 list of priorities to demonstrate how much we had accomplished. It was impressive. I am not going to repeat the list here, but I’d like to emphasize just two of the items I found the most exciting. We held our first UKI agility trial, and we held our first C-Wags trial. I am particularly excited that Shadow Dog Sports has successfully run events from other organizations. We have heard from the club, and this is a direction you want us to continue to pursue. That brings me to a main point of emphasis for this blog. We need volunteer participation to pull all these events off. The good news is that so many of you have been responding to our requests. At the same time, there are numerous members who have not discovered how much we need and appreciate their participation. I just Saturday at a wonderful Fun Match at our building. It was good to see so many of our members entered and helping as judges, stewards and stepping up to do, well, everything. We also had participants from nearly all over the state. It was very successful, profitable, and easily repeatable, with your help. Thank you to those who were there, and we will look forward to more matches in the future. This coming weekend is our AKC Obedience and Rally Trial. I have been extraordinarily pleased with the response to the request for stewards. Thank you! The schedule has been sent out to the stewards. Whew! One big worry gone. My only wish at this point would be to lighten the load on a few people whose names are on the chart quite frequently. So if anyone hasn’t already volunteered and would like to offer your services as a steward, no experience is necessary. Send me an e-mail at Phlangdon@mac.com, and I will add you to the schedule. In February, we have a Novice Only trial at our building! If you have not entered, there’s still time. Entries close on February 2. We have wanted to do this for quite some time, and I am thrilled that we are going to pull it off. We have seen just a bit of confusion in our registration system. You can do the whole process the traditional way. Fill out the registration and mail it with your check. OR, you can take care of it electronically but it is in two steps. E-mail your completed registration form to the trial secretary AND go online, select the events, see your total fee, then pay online. Sorry for any confusion, but we are novices at this particular methodology. We’ll work on it! March will bring our second C-Wags trial, tentatively, on March 11 and 12. The fall C-Wags trial was a resounding success, and this one is perfect as a precursor to our May AKC Obedience and Rally Trial. If you haven’t tried C-Wags yet, check it out. http://www.c-wags.org/ You can reward and talk to your dog in the ring, have fun with your dog, work on building duration with no rewards, practice exercises that are very similar to AKC, and get TITLES! April is chock full of Agility. We are not certain yet if we will be doing another UKI trial, but we still have two AKC Agility trials on the agenda. This is where we can really use some help. Two of the hardest tasks for the trial occur in setting rings up prior to the first runs and taking rings down after the last run is completed. Mark your calendars now. We will be doing the first set up on April 5 and tearing down on April 9. The second set up will be April 26 and tear down on the 30th. Please send me an e-mail if you can assist with the set up or tear down. We are still not done for the spring. In May, we have our second AKC Obedience and Rally Trial. Again, we need a host of volunteers to steward at the trial, bring food, help set up and tear down. The May trial is scheduled for May 6 and 7. Please put the dates on your calendars. Make a commitment to join us for as many of them as you can. We appreciate your assistance. Keep up the fantastic work! Goodness! The summer has gone by slowly! Yes, I know, that is not the usual sentiment for how a summer passes, but I spent most of mine in a long arm cast because of a broken arm. Believe me, it passed excruciatingly slowly. I sincerely hope your summer was more comfortable than mine. As a quick side note, we are in particular need of folks to help set up the equipment for the agility trial the morning of September 29. Send Peggy an e-mail if you can assist with the trial set-up. Please consider volunteering for ring crew positions, as well. You can do that on the Member Volunteer survey or send me an e-mail and I will forward it to the trial committee. That's it for now. See y'all soon! Pups, Play, People, and Picnic! What a great event! We had some amazing contributions to the food table, including 3 different kinds of barbecue, salads galore, and desserts to die for! I think we had about 35 folks in attendance and nearly as many dogs. The consensus is that we will try to do a summer social like this again next year. Cody, hoping that Nell toppled Temptation Tower right to him. No such luck. Cody held his stay, Nell built an awesome tower, and after a minute, I am sure Nell gave him one of those delicious peanut butter biscuits. Here's Charlie attempting to solve the puzzles of the now famous, hand-made by Nan, "Jem's Bored". Fiendishly difficult puzzles hiding amazing rewards. Our high score was 7 out of 9 puzzles correctly solved. It was fascinating to see the dogs figure out so many of the puzzles. One other piece of news is that we finally have a more member friendly Facebook group. We are retaining the one that is more public-facing, with an administrator posting for the club, but we also created a brand new group. It is private, open to all club members and everyone can post. You can find the group, and ask to join by searching for "Greater Columbia Obedience Club, Inc". There are already lots more pictures from the June meeting, lots of recent brags, and assorted other posts. We hope you find the FB group a nice way to communicate with your fellow club members. No club meeting for July, but we'll be back for our August meeting. See you then! We have received a few requests for formal obedience classes and I would like to take a moment to explain that we already are teaching formal obedience. However, we must not be explaining the classes well enough or frequently enough, so I would like to use this blog to share the rationale for our competition classes. In a previous life, I coached women's basketball and I’d like to compare my experience of teaching athletic skills to young women, to teaching dog sports skills to dogs. I taught about 10 sequential steps just to teach my players how to shoot a layup with their non-dominant hand. My practices would consist of foundation drills and mini games that may only emphasize one piece of a behavior chain. Several weeks of practice would go by before I ever allowed players to "scrimmage", to put it all together in a game like environment. Eventually, we'd be as ready as we could be for game day. Dog training is really no different. First, you teach the pieces. Gradually, you string those pieces together to create a behavior chain, and eventually you have a complete exercise. 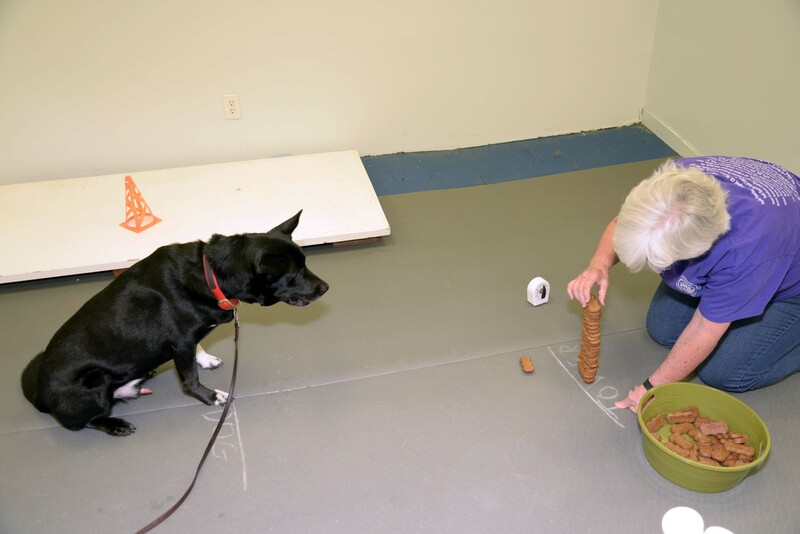 The class titled Building Blocks is really the class to teach the foundations of formal obedience skills. In it you work on fronts, finishes, retrieves, directed jumping, drops on recall, scent discrimination, signals at a distance, and virtually every skill required for your dog to compete in formal obedience from beginner novice through utility. At the same time you are developing skills, you also need to build engagement, focus, duration and confidence. 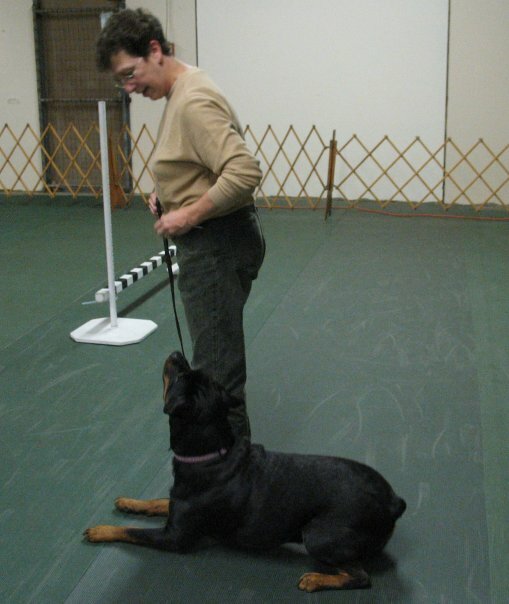 You want your dog to be capable of heeling correctly, for the duration required, in a distracting environment. You want your dog to be capable of selecting the correct article while mom's nerves are turning her into a strange new person. You want to prepare your dog for the ring environment. You enter matches, show n go's, and the CWAGS trials. Finally, it's trial day. You and your dog will enter the ring, nervous but confident, well-prepared and ready to compete. Maybe you'll "Q". Maybe not, but you will be as ready as you can be. If all I did in my basketball practices was run drills, the girls would have no idea how to play a game. And if all we did was scrimmage, well, I can tell you, it would be sloppy. So good coaching requires working on the pieces, putting it together, putting it to the test, and finally, entering a trial. So, that's the rationale behind building block classes, engagement classes, and putting it together classes. As trials approach, we absolutely will have matches and "ring ready" classes. In the meantime, take the building blocks classes, flip over to doing some focus and engagement classes, add the putting it together classes, enter matches to find any holes in your training, and enter a trial. I think you will like the results. We have had a busy start to 2016! 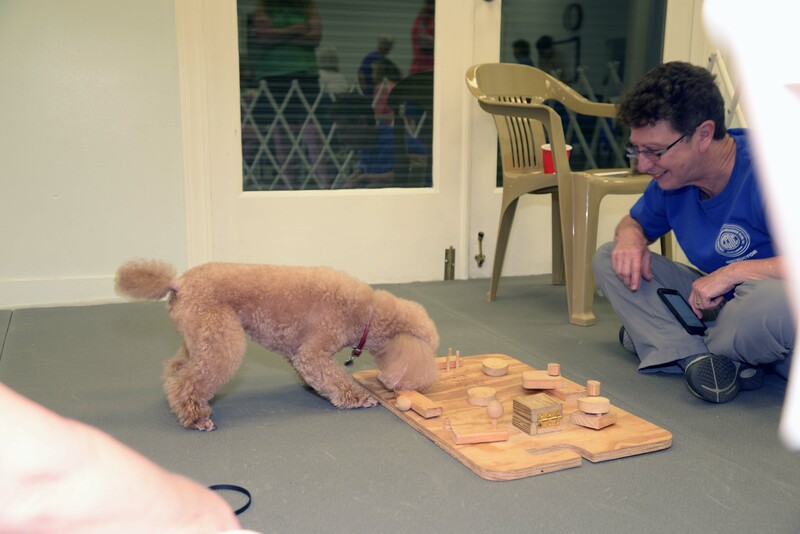 Our very successful January obedience trial kicked off the year and immediately after the trial, our classes went into full swing. Then we decided to attempt to buy a GCOC building! It looked very promising to start, but alas, the costs to bring the building up to code were too great. We learned many things from the effort and will stay aware of opportunities for future purchase of a permanent home for GCOC. Since the beginning of April, we have completed 4 trials! We held 3 agility trials, including our very first Shadow Dog Sports event, and most recently, our second obedience trial of the year. Now, we get a bit of a break. No big events until the fall. Yay! I can’t resist giving some hints of what is to come. Perhaps another UKI trial? Nosework? Did someone say Nosework? Shadow Dog Sports and CWAGS? What’s CWAGS? Our events committee has been planning up a storm! You will hear more as we get closer to some of these exciting events. But now, it is time to have some fun! The June meeting has been declared a social meeting! Join us for our very first: Pups, Play, People, and Picnic! Bring your dog(s)! We will be providing barbeque, buns, drinks, and paper products. Bring a side dish to share (people food). We will not be having a business meeting unless really necessary. It’s a fun and games night! Oh and Brags! We have lots of Brags! If you are new to the club, please join us for an opportunity to get to know your fellow club members. If you’re a long time member, but haven’t attended a meeting in a while, join us for this one, and re-introduce yourself. Gayle Mitchiner is in charge of the fun and games and maybe she’ll drop some hints for us as June draws closer. In the meantime, thank you to the members who have worked so hard to start our year off with a bang! Fortunately, there are too many different people to thank to list them all here. It really is gratifying to ask and get responses for assistance when we ask! Thank you, thank you, thank you! Now, come have some fun! We have had so many things going on in April and May! We have held two of the three agility trials this month, including our very first UKI trial as Shadow Dog Sports. We recently completed a very successful Show 'n Go. Coming up, we have the third agility trial, a "C" match the night before our obedience trial, and of course, the obedience trial itself. Whew! I know that you have noticed the recent e-mails asking for help, but I have to add my plea for your assistance. Some folks have been members for years and support us even when they don't have a dog to train! Some are brand new and immediately expressed a willingness to assist. Some are there every single time we send out a request for help. Spending time giving to the club enables you to participate in our growth. And you connect with like-minded, dog-loving enthusiasts. How cool is that? We need a few more volunteers to assist with tearing down the equipment after the completion of the last agility trial on Monday, May 1. Robin Hutson thinks 20 folks showing up about 3:00 p.m. on Sunday would have everything completed in an hour. And of course, we could use some help as ring crews and other jobs during each event. No experience necessary. A great job is sitting in a chair watching all the dogs compete and re-setting dropped bars! Not hard at all! We need folks to help provide the lunches for the obedience trial. We used to do this all the time! I remember the room at the Fairgrounds filled with everyone's contributions. It was a feast! And this year we have returned to that tradition, and we need you to go back to the old habit of cooking your specialties and bringing them in. We love your cooking, so share, please! And as you know from earlier e-mails, Caroline Hair needs stewards for the trial. Please help us out! E-mail me, mailto:Phlangdon@mac.com and I will get you connected to the event that fits your schedule. Or you can call me @ 803-553-0671. I really have to say we might have outdone ourselves last night! The chili was delicious! Thanks, Jane! And the program with Cilla Phillips and Faye Erickson was informative and quite entertaining! Faye's Chopper, teamed with Cilla's Sidney in a "brace" was great fun. If folks are interested in learning more about carting or perhaps having Cilla do a clinic for us, reply to this blog and we'll see what we can arrange. Then on to the content of the meeting. It seemed rather tame considering we didn't have any information about the building to discuss. Except to explain that the projected cost of bringing the building up to code was more than we could afford. So, back to the drawing board on the building. We are not actively looking for a building or land, but if anyone sees anything promising, let us know and we will at least explore the opportunities. We learned a lot from this process and hopefully it will lead to a building for us in the future. There was an active discussion about membership procedures and requirements. Alison Rosenberg is heading up the committee to help us streamline our membership process and develop some ideas to increase member involvement. Feel free to drop her a line if you have any comments or suggestions for Alison Rosenberg. You will be hearing more about the progress of the Membership Committee in the months to come. We have all our committees working hard to bring us more events, an outstanding Obedience trial, numerous Agility Trials, and of course a building maintenance committee that keeps the toilets flowing. Ok, that isn't particularly glamorous but Ron Patterson is going to help make sure everything is functioning just fine. We have one new policy to review. The Obedience Training Committee introduced a proposed Aggressive Dog Policy to the board on March 31. I mentioned it last evening in the meeting along with a quick review of how policies are going to be created. So here it is in brief. A policy is proposed and is posted to the website here: Policies and Procedures under Discussion Members are to review the policies and make comments on the blog. The committee will review all comments and put together a final policy. It gets submitted to the board, approved and posted to the Policies and Procedures page of the website. Policies will be open for review and commentary for two weeks. So, click here: Policies and Procedures under Discussion page and make your comments. That's it this time around. See you at the next club meeting on May 6. This isn't intended to replace the minutes of the meeting but I just want to share some of the things you missed. Thank you, Katie for the idea. First! Robbie's delicious cooking! Thanks to both Robbie and Mary for bringing us such scrumptious fare for a club meeting! Next, Tracy Seiler gave us a tour of some features on the website that she discovered or added. Check out the Honor Roll, and then send updates and new postings to Tracy. Want to get more involved? Click here: GCOC Committees Then send an e-mail to the chair of the committee if you would like to help. and comment on the blog or send your comments to me in an e-mail. I know there are lots of links in this blog but one of my goals for the club is improved communication. I want to make it easier for club members to find out what is going on and more importantly, how you can get involved. All rights reserved. Copyright ® 2013.